The latest Derby magistrates’ court results including cases from Ripley and Heanor, Belper and Ilkeston. Graham Anthony Hazledine, 44, of Norman Street, Ilkeston. Pleaded guilty to exceeding the alcohol drink-drive limit on Norman Street, at Ilkeston. Fined £360 and must pay a £36 victim surcharge and £85 costs. Disqualified from holding or obtaining a driving licence for 12 months. Joanne Claire Raven, 49, of Calvert Close, Heanor. Pleaded guilty to exceeding the alcohol drink-drive limit on Thompson Street, at Langley Mill, Heanor. Must pay an £85 victim surcharge and £85 costs. Community order to last until September 30, 2019, with 80 hours of unpaid work. Disqualified from holding or obtaining a driving licence for 24 months. Craig Andrew Hildred, 45, of Town Street, Sandiacre. Pleaded guilty to pursuing a course of conduct which amounted to harassment by being verbally abusive and insulting. Pleaded guilty to using threatening behaviour. Must pay a £115 victim surcharge. Committed to prison for 12 weeks suspended for 12 months on the grounds the offence was so serious because he persistently followed a certain person and made threats. Restraining order to last until September 30, 2019. Bethany Booth, 18, of Lower Drive, Swanwick, Alfreton. Pleaded guilty to using a vehicle without insurance on Chalons Way, Ilkeston. Fined £255 and must pay a £30 victim surcharge and £85 costs. Driving record endorsed with six points. Alyx Clark, 19, of Kew Crescent, Marlpool, Heanor. Pleaded guilty to driving a vehicle without due care and attention on Cromford Road, at Langley Mill. Fined £50 and must pay £85 costs. Driving record endorsed with six points. Pleaded guilty to using a vehicle without insurance on Cromford Road, at Langley Mill. No separate penalty. Daniel Clarke, 32, of The Crescent, Stanley Common, Ilkeston. Pleaded guilty to driving a vehicle at a speed exceeding 70mph on the A38 Lichfield Road, at Burton. Fined £61 and must pay a £30 victim surcharge and £85 costs. Driving record endorsed with three points. No totting disqualification due to mitigating circumstances of facing exceptional hardship. Jonathan Staniforth, 39, of Wellington Street, Long Eaton. Pleaded guilty under the Single Justice Procedure that he used a vehicle without insurance on Northfield Avenue, at Sawley. Fined £276 and must pay a £30 victim surcharge. Driving record endorsed with six points. No totting disqualification due to mitigating circumstances of facing exceptional hardship. Christopher Stephen Ellis, 43, of Goodwin Close, Sandiacre. Pleaded guilty under the Single Justice Procedure to using a vehicle without insurance on Princess Street, at Long Eaton. Fined £120 and must pay a £30 victim surcharge and £85 costs. No totting disqualification due to mitigating circumstances of exceptional hardship. Driving record endorsed with six points. Pleaded guilty under the Single Justice Procedure to using a vehicle without a test certificate on Princess Street, at Long Eaton. No separate penalty. Robert Anthony Wilkinson, 41, of Water Lane, South Normanton, Alfreton. Pleaded guilty to driving a vehicle when he was using a handheld mobile telephone on Moor Croft, at Matlock. Fined £200 and must pay a £30 victim surcharge and £85 costs. Driving record endorsed with six points. Jack Joshua Roome, 19, of Granby Street, Ilkeston. Pleaded guilty to driving on a restricted road, namely the A6096 Ladywood Road, at Ilkeston, at a speed exceeding 30mph, namely 46mph. Fined £80 and must pay a £30 victim surcharge and £85 costs. Driving record endorsed with six points. Carl Peel, 47, of Quantock Road, Long Eaton. Pleaded guilty to exceeding the alcohol drink-drive limit. Fined £246 and must pay a £30 victim surcharge and £85 costs. Disqualified from driving for 18 months. Pleaded guilty to using a vehicle without insurance. No separate penalty. Lee Anthony Rhodes, 23, HM Prison, Perry Road, Nottingham. Pleaded guilty to damaging two wooden flat doors, roof tiles and a cupboard door at Litton Close, Ilkeston, to the value of approximately £1,000 belonging to EMH Homes. Must pay a £115 victim surcharge. Pleaded guilty to using threatening behaviour at Litton Close, Ilkeston. Committed to prison for ten weeks on the grounds the offence was deemed to be so serious because he caused the victims to flee from a home while chasing them with a hammer. Matthew Joseph Woodward, 32, of Bridge View, Milford, Belper. Indicated a guilty plea to attending an address on Derby Road, at Milford, Belper, and asked for money causing alarm, harassment and distress which he was prohibited from doing by a restraining order. 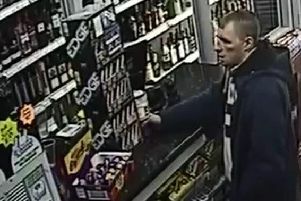 Indicated a guilty plea to stealing a bottle of Courvoisier Cognac valued at £35 belonging to Morrisons supermarket, on Chapel Street, Belper. Must pay £35 compensation. Indicated a guilty plea to damaging a television valued at £200 at Kingswood Avenue, Far Laund, Belper. Must pay £200 compensation. Committed to prison for 18 weeks. Alyx Clark, 19, of Kew Crescent, Marlpool, Heanor. Pleaded guilty to using threatening behaviour with intent to cause harassment, alarm or distress to police officers at Kew Crescent, Heanor. Discharged conditionally for two years. Must pay a £20 victim surcharge and £85 costs. Rafael Herbert, 36, of Castle View, Langley Mill. Admitted failing to comply with the supervision requirements imposed following release from imprisonment by failing to attend with the supervising officer. Committed to prison for seven days. Gary James Drayton, 31, of Main Street, Awsworth, Nottingham. Pleaded guilty under the Single Justice Procedure that he damaged doors, windows and a vehicle to the value of £1,464.95. Must pay £1,465 compensation, an £85 victim surcharge and £85 costs. Community order to last until April 2, 2020, with a Rehabilitation Activity Requirement and 80 hours of unpaid work. Restraining order to last until October 2, 2020. Thomas Stanley Morgan, 24, of Stanton Road, Sandiacre. Pleaded guilty to stealing various chocolates valued at £6 belonging to Tesco on Nottingham Road, at Ilkeston. Must pay £6 compensation. Pleaded guilty to stealing various meats valued at £43.57 belonging to Morrisons, on Nottingham Road, Ilkeston. Pleaded guilty to stealing various chocolates and milk valued at £8 belonging to Tesco on Nottingham Road, at Ilkeston. Pleaded guilty to stealing various chocolates valued at £5 belonging to Tesco. Pleaded guilty to stealing various meats valued at £18 belonging to Tesco. Admitted committing an offence while subject to a conditional discharge order of 12 months imposed for offences of handling stolen goods and theft from a shop. No adjudication. Dealt with for the original offences which were subject to the conditional discharge including dishonestly undertaking or assisting in the retention, removal or disposal or realisation of stolen goods namely DVDs and stealing a can of beer belonging to B&M at Long Eaton. Committed to prison for 18 weeks. Lisa James, 34, of Godfrey Drive, Kirk Hallam. Verdict proved under the Single Justice Procedure that she threw, dropped or otherwise deposited litter, namely paper wrappings, and left it in Derwent Street, Derby. Fined £660 and must pay a £66 victim surcharge and £155.16 costs. Clinton Carl Breward, 42, of Thirlmere Road, Long Eaton. Indicated a guilty plea to possessing a quantity of Buprenorphine, a controlled class C drug. Must pay a £20 victim surcharge, Indicated a guilty plea to possessing a quantity of Diazepam, a controlled class C drug. Indicated a guilty plea to possessing Tramadol, a class C drug. Discharged conditionally for 12 months.